Four years ago, former US vice-president Al Gore raised some alarming questions about climate change in his Oscar-winning film An Inconvenient Truth. A German filmmaker has now tried to provide some answers in a documentary. 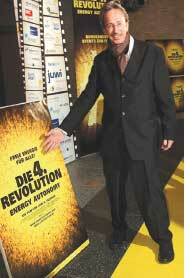 Carl Fechner’s The Fourth Revolution - Energy Autonomy tries to show how the world could be getting all its energy from renewable sources in 30 years. The film has attracted rave reviews and fierce criticism in German press since it opened in the last week of March. It has been lauded for spelling out a fossil fuel-free route but denounced as political propaganda for suggesting powerful special interests are blocking wider use of renewables. The film shows a concentrated solar power plant in Spain producing enough electricity for 100,000 people, a wind energy network in Denmark and solar power projects in Bangladesh.